Pentecost (Pfingsten in German) celebrates the time when 'suddenly there came a sound from heaven as of a rushing mighty wind, and it filled all the house where they were sitting.' Appropriately, on Pentecost Monday, usually known as Whit Monday, a freak windstorm pummeled the westernmost state in Germany, Northern Rhine-Westphalia, leaving scenes of destruction like this. Six people died, traffic was disrupted for days, and something like 20,000 trees were uprooted, many others damaged. And we didn't even get a visitation by the Holy Spirit out of it. Everywhere you go in Düsseldorf, there are still uprooted trees slowly dying, and tree branches scattered on the side of the road, where they were hastily cleared away to permit traffic to pass. And yet the city administration quickly issued a warning to all residents: the trees and branches blown over by the storm are the property of the city, and anyone appropriating them commits theft (g). This is in contrast to most of the neighboring towns, which encouraged citizens to clear away the wood. This caused a controversy, which I plan to ignore. Instead, I want to focus on the word for the downed trees: Sturmholz. It couldn't be easier: Sturm (storm) + Holz (wood) = Stormwood. I've quizzed a few friends, and they report they'd never heard of the word before the storm, but instantly grasped what it referred to. The Lego Language provides yet another compact word for something that other, sloppier, lazier, smellier, louder, less efficient, more Southern European (g) languages would need an entire phrase to convey. I've got a bleg. A few years ago I was in a Japanese restaurant here in Düsseldorf, and on the wall was a quotation (in German) that went something like: 'Every speech in praise of the heroism of a fallen soldier in the last war guarantees the death of three more in the next war.' My recall of the wording is really vague, which is why I can't find this on my own. I think it was from Tucholsky, seems like something he would say, but Im not 100% sure. I would really appreciate any help finding the exact source. DÜSSELDORF — The hulking white block of the Rheinmetall headquarters dominates the Derendorf neighborhood of Düsseldorf, Germany. Although the building is shrouded in secrecy and access is restricted, there can be little doubt that champagne corks are popping inside. The reason? Rheinmetall has just signed a 3 billion Euro contract (g) to sell almost a thousand ultra-lethal 'Fox' tanks to the authoritarian regime currently in power in oil-rich Algeria. The news sent Rheinmetall's stock soaring, further enriching the thousands of Germans who profit from weapons exports to repressive regimes in the developing world. Rheinmetall, notorious for murderously exploiting slave labor to build weapons for the Nazis, had to apply to the German government for permission to export the tanks to the crisis-racked regime in Algeria, which only a few years ago was mired in a bloody civil war. But the German government, which constantly lectures other nations on the need to solve problems peacefully, casually rubber-stamped the deal. Spokesmen for the German government invoked the always-convenient specter of terrorism, claiming that the Algerian government was a key ally in the struggle against Al-Qaeda. But many observers are convinced the government was really eyeing the spectacular profits that would further fatten the coffers of one of Germany's richest and most politically influential companies. Time was I could barely post a cultural trivia contest before it was answered in comments. Either I've been picking much too difficult questions or my blog audience has become a lot more ignant. You people, frankly, have disappointed me. You hardly deserve to have your curiosity satisfied, assuming you have any to begin with. Yet I am a merciful quizmaster, so I will provide the answers. Lady Godiva Rides Again, released in the United States as Bikini Baby, is a 1951 British comedy film starring Pauline Stroud, about a small-town English girl who wins a beauty contest and heads for greater fame after appearing as Lady Godiva in a pageant. The film is most notable for the presence of actresses who were later to become famous. Diana Dors, who appears as a beauty queen, was later marketed as the film's star. It also features Joan Collins in her movie debut as an uncredited beauty contestant. Ruth Ellis, the last woman to be executed in England, also appears as an uncredited beauty queen. Ruth, who was four months pregnant at the time, had dyed her hair black and had styled it into a bob. If you're a native English speaker, or even a mildly competent ESL speaker, you may have noticed that 'place of events' is something no proper English speaker has ever or would ever think, say, or write. It has every hallmark of Denglish obtuseness — the awkward adjectival phrase, the faintly ludicrous non-specificity (is there any location in space-time that is not a 'place of events'? ), the cack-handed attempt to convey a sense of excitement by stitching together a few random words in the lingua franca of hipness. It looks like something you would read on a Thai T-shirt, or what you'd get if you asked a group of retired East German coal miners twenty seconds to think of a really cool English slogan for their local senior center. And yet this is the official slogan of a multimillion dollar convention center in Germany's most populous state. This humiliating testament to the dreary stuffiness of German corporate culture has appeared on millions of signs, billboards, stickers, notebooks, cocktail napkins, sanitary pads, shell casings, flags, and streetcar-side advertisements. What caused this train wreck? One part of me says the answer is obvious. The convention center's marketing director, Alexander Remigius Maximilian Cornelius Ignaz Baron von Shicklgruber started the slogan meeting by saying: 'It came to me over the weekend: Place of Events!' and his fawning underlings immediately congratulated him on the staggering awesomeness of his idea. 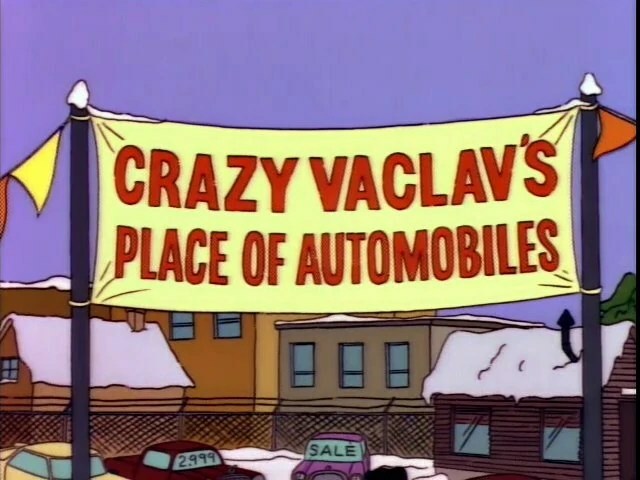 But maybe the inspiration was Crazy Vaclav, the swarthy, heavily-accented auto dealer from an unspecified Eastern European country featured in the 1992 Simpsons episode Mr. Plow. (unembeddable video link here). He tries to sell Homer a car from a country that 'no longer exists'. As the Simpsons Wiki puts it, the car is deficient in legroom, 'even for the driver'. The name of Vaclav's car dealership? Given Germany's role as self-appointed Sole Remaining Keeper of the Flame of Intellectual Property™, I can only hope Carl Douglas was handsomely compensated for the traumatic defunkification of his song. (Right?). Still no response to the last trivia contest, so here's a new one. You're going to love this. Tell me the name of any full-length movie drama (not a short or documentary) that stars an actor or actress who was later executed for murder in real life. There's at least one correct answer to this question.